Small room but nicely decorated. Good bed and clean bathroom. Wifi worked fine. Person at the desk was friendly and helpful the rooms were nice enough they have free rags for cleaning your offroad vehicles that seem to be popular there. I needed one to clean the windows on my car which was convenient. Front staff went out of their way to help me and improved my overall stay. Clean, spacious room. Loved the hard flooring that made it feel much cleaner. Pool and hot tub were very nice and relaxing. Extremely convenient location. Comfortable room. Useful staff. Would have been nice to have breakfast included in the room price - maybe with a tie up at a local restaurant, if it’s abdolutely not feasible to provide one onsite. We were on the 2nd floor and there was constant children running up above us and dropping things into the wee hours of the night and first thing in the morning. The room was very rundown and needed attention. It is in a good location though, within walking distance to everything. The Lodge was great. Staff was friendly and helpful. Enjoyed our visit to the Natl. Park. Town had variety of shopping and dining. Most off season activities were not available but would have been good. In season. Would return for vacation with family for several days. Very happy with room and location. Close to town and restaurants. After a long day it was great to be close to the next adventure on our journey. Thanks. We stayed two nights to visit Arches NP and Canyonlands NP. We had mosquito in our room. Next morning, we talked to a chubby woman at the front desk that we had mosquito in our room and asked her to spray "Raid" or something. On the second night, we killed a couple of mosquito. When we checked out, we asked to the same chubby woman whether they spay flying insect killer in our room. She said "No" because the room cleaning person didn't find mosquito in our room. I showed dead mosquito that we killed. Do you know what she said to us? She said, "WE DID NOT PUT MOSQUITO IN YOUR ROOM." I could not believe my ears! It was so outrageous! No professional service attitude! So, just don't stay at this place. Room was very small. No breakfast. Overcharged. Great set up there. All the amenities and location, location, location. Food in restaurant good too and reasonable. Great value. Everything was wonderful. Walking distance to everything downtown. Close to Arches NP. Great wifi. Room was clean and comfy with good air conditioning. Only thing they need to add is offering free breakfast in the morning. Only coffee is offered at this time. Nice, clean hotel in a convenient location. Staff friendly and willing to provide information along with coupons to local restaurants. Heated pool along with a friendly hotel cat! Only complaint would be the floors are not carpeted and can hear people walking in rooms above and doors to rooms don't close softly, often waking up guests sleeping in. Overall, would stay again and would definitely recommend to family and friends. Check in was fast; receptionist very friendly and helpful .. provided us with two discount coupons for nearby dinner and breakfast. Did not use pool but heard others say it was nice. Room was small; liked the hardwood flooring. Room on third floor facing back of hotel had beautiful view of the canyons..probably would not have view if you are on 1st or 2nd floor. No king beds only queens as rooms are on small side. Thought mattress was too firm .. no pillow too or additional padding and I could hear springs squeak whenever I turned. If only staying one night it is fine especially if not waning to spend much on a room. 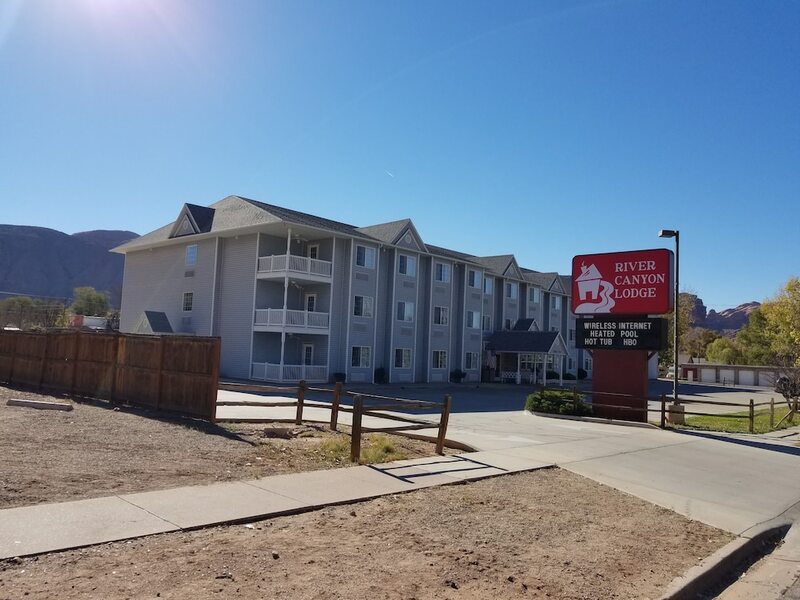 Located within a 5-minute walk of Swanny City Park, River Canyon Lodge is within a 15-minute stroll of Moab Information Center. This 80-room hotel has an outdoor pool, free in-room WiFi, and free self parking. Guests can expect to find free WiFi and 47-inch a TV with cable channels. Other standard amenities include a refrigerator, a microwave, and free local calls. River Canyon Lodge offers an outdoor pool, a spa tub, and free WiFi in public areas. You can put free parking to good use if you drive. The front desk is staffed 24/7 to help secure valuables, and answer any questions about the accommodations. This hotel also has coffee/tea in a common area. Good Morning, thank you for your feedback we appreciate it. Thank you for choosing River Canyon Lodge for your stay hope to see you back soon.